Payday week brings a whole host of treat yo’self moments. In my case, these moments have included raiding Holland and Barrett, stocking up on goodies from MyProtein (come at me, kilo of almond butter) and buying some new healthy living cookbooks to add to my already crammed kitchen shelf (I don’t know what it is about September, but I just want to curl up with good cookbook and plan how I’m going to eat my way through Autumn and Winter. #girlgains indeed). My Hemsley Hemsley, Madeleine Shaw, Deliciously Ella and Amelia Freer books are looking well-thumbed and heavily bookmarked from being referred to for pretty much every meal over the last year or so, and although I love them to bits, sometimes you’ve got to switch things up. So, the other day, I ordered a couple of new tomes which I’m sure will become firm food favourites. Although this book isn’t new, it’s new to me. I’ve long been a fan of wellbeing babe Natasha Corrett and her philosophy of following an alkaline-based diet, so this is a long overdue addition to my collection. I seriously can’t work out why I haven’t bought it until now? On first glance, I’m pretty impressed already; Coconut Flour Chocolate Mousse Cake, need I say more? When I spotted Elly Curshen (or EllyPear to you and me) tweet about Gizzi’s latest book only being £6 on Amazon, I wanted to bag me a healthy bargain. 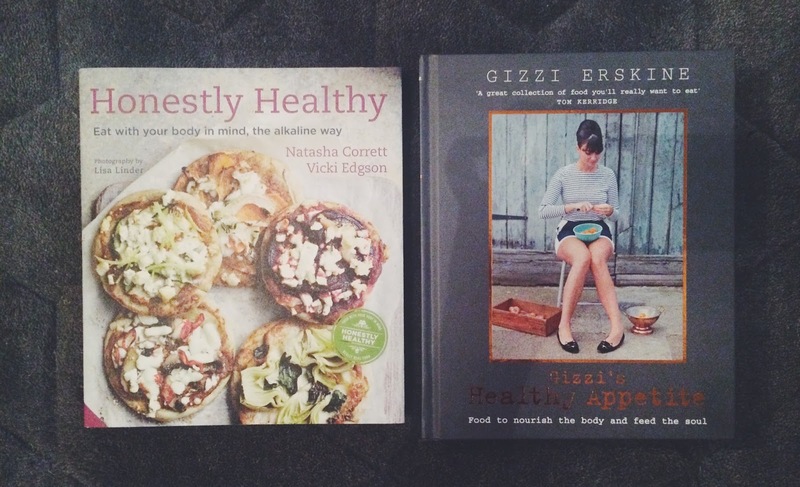 I’ve always loved the look of Gizzi’s food (and her incredible style) but I’ve never got round to buying anything she’s penned. This is Gizzi’s take on how eating healthily doesn’t need to compromise on taste and that you don’t need to be afraid of dairy, gluten and the humble potato to keep your body nourished. So what’s already on my hit-list from her latest book? Carnitas with grilled pineapple salsa and pink pickled onions. Hubba hubba. Have you tried any recipes from these books? Let me know you what your favourites are and any other cookbooks you’ve been loving recently.